UMP | University of Minnesota Press Blog: What are the implications of philanthropic relationships in education? What are the implications of philanthropic relationships in education? On a spring day in 2010, I interviewed Sebastian Thomas, head of the in-house nonprofit organization at the public New York City high school at which I taught for two years (referred to here as “College Prep”). Thomas was responsible for organizing the benefits, films, flyers, media, and other forms of PR that “sold” our unscreened, traditional public school to private-sector funders, who supplemented the resources we were getting from the state. It wasn’t hard to make our school look like a worthy cause. Our numbers looked good. College Prep’s student body was predominantly black and brown, and teachers were predominantly white. About 80% of the student body was eligible for free or reduced-price lunch. Unlike many urban schools that served a similar demographic, College Prep boasted a 93% graduation rate and a 97% college matriculation rate for its students. Due to Thomas’s hard work, donors to College Prep’s nonprofit included, among others, a corporate firm in midtown Manhattan, the Gates foundation, and the Robin Hood Foundation, as well as more than 300 individuals who contributed $5,000 or more. If some rich, important person has his or her heartstrings tugged by the story of so-and-so, and that person writes us a check for like $30,000 and then we are able to do all this stuff with it, is that okay? I don’t know. I am still asking myself that question. I don’t know. Thomas shared an anecdote about NBC wanting to film a show that would feature Sarah Ferguson, the Duchess of York, giving a college scholarship to a student with a “big sob story.” Thomas pulled aside one student, Kadeem, who had been raised by his grandmother in an impoverished section of the city, and asked him if he was interested. But, he advised Kadeem, he should only agree to this if he was comfortable. Thomas explained to Kadeem, “TV producers are always looking for the human-interest story, even if ironically it takes the humanity out of the person who they are interviewing.” He advised Kadeem not to sell himself out, but told him: “sometimes we buy ourselves opportunity by telling people what they want to hear.” In sharing this information both with Kadeem and again with me in the interview, Thomas expressed his ambivalence about his work. On the one hand, College Prep is served well by access to important private-sector resources. On the other hand, in order to access the resources, the institution has to conform to, and in fact rely on, a very specific image that both conflates and reifies problematic stereotypes about race, class, and place: the needy (but college-bound) black or brown student, the white (female) savior teacher, and the generous white (male) corporate funder. In fact, while at the school, I attended a posh benefit at the corporate office of one of the school’s sponsors. At a meeting beforehand, Thomas coached me, along with a few other teachers and students he chose to attend, to “sell” and “talk up” the school. Students were to attend the benefit in uniform, teachers were to “dress like teachers,” we were not to walk around the room in groups larger than two, and we were not to eat much (since we were supposed to focus on talking up the school) nor were we to partake from the two open bars at the event. The keynote speaker, a white female corporate lawyer, emphasized the neediness of College Prep’s college-bound students, and funders dropped checks made out to the foundation into a box in the back of the room as they left. The revenue from that benefit equated to one-third of the Foundation’s budget for the year. While some of our students came from low-income families, others came from middle-class ones. While some of our students would be the first in their families to attend college, others had parents with college and graduate degrees. While some of our students were homeless or lived in shelters, others went home every day to traditional two-parent nuclear families. Yet in the keynote speech at the event, the narrative about College Prep students was not one that allowed for diversity of experience or collective solidarity. Rather, it was one that constructed College Prep as a unique miracle, a school that worked with kids who, despite coming from the most challenging of circumstances, were set up for college matriculation and success due to their hardworking teachers and the generosity of funders. What are the implications of philanthropic relationships in education? 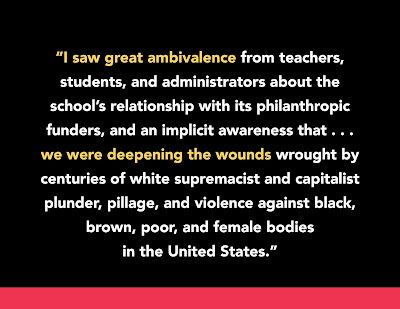 At every level at College Prep, I saw great ambivalence from teachers, students and administrators about the school’s relationship with its philanthropic funders, and an implicit awareness that we were not healing, rather we were deepening the wounds wrought by centuries of white supremacist and capitalist plunder, pillage and violence against black, brown, poor, and female bodies in the United States. We think of love as an individual feeling, act, or intention and in many ways we think of solidarity in the same way. Indeed, at College Prep, it seems that while it might be important to practice love and solidarity on an individual level, this is not enough. Rather, through agonistic solidarity, we might reach a place of what Tricia Rose, bell hooks, and James Baldwin have termed as both affirmational and transformational love, a love that is grounded in students’ nuanced and diverse lives, agency, and experience but also sees the potential for growth and collective resistance against schools’ dependence on inequity, competition, and marketing students for resources. This kind of love and solidarity also would lead to policy shifts: perhaps changing our tax structure so that we have fair funding formulas in each city and state that lead to equity, as well as ensuring that people have access to affordable food and good health care, and ending environmental destruction. Policy shifts in the interest of affirmational and transformational love and agonistic solidarity would ensure that teachers are well supported, with strong, community-engaged unions that prioritize the experiences of children and families, and work for racial and class justice. “Love” in the form of philanthropy and privatization of schools, or in the form of individual actions or feelings does not lead us to a place of equity, agonistic solidarity and healing. Through both policy and practice, perhaps we can work toward collective resistance and creative alternatives. Amy Brown is author of A Good Investment? 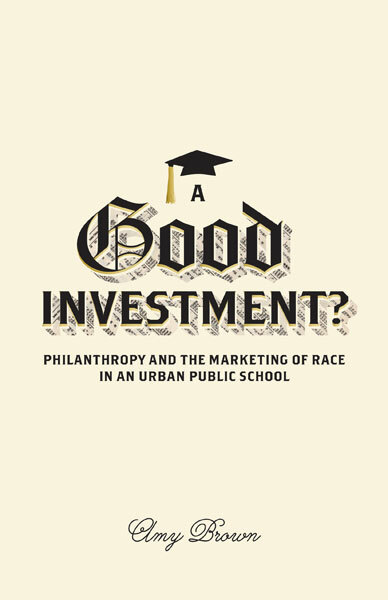 Philanthropy and the Marketing of Race in an Urban Public School. She is an educational anthropologist and a faculty member in the Critical Writing Program at the University of Pennsylvania.